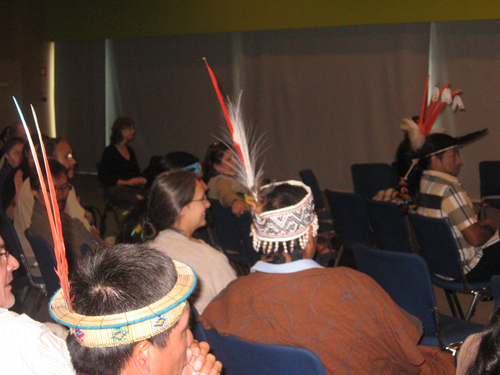 The Community Poble dialogue space is a venue within the World Conservation Congress for local, community and indigenous voices – grassroots groups working at the nexus of biodiversity conservation and poverty reduction – to share best practices, inform policy, celebrate successes, and tackle common challenges. 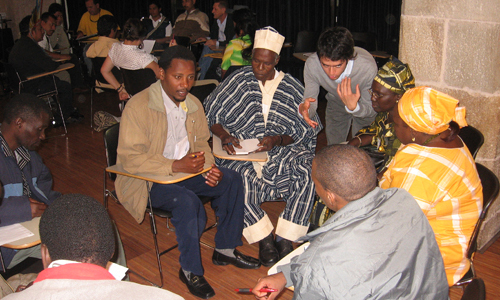 In the tradition of the past nine dialogue spaces, the Poble will serve as a platform for communities to leverage the Equator Initiative’s unique partnerships across the United Nations, civil society, business, government, and academia to strengthen and amplify their innovations in conservation and poverty alleviation. Poble participants will include representatives from the 25 winning communities of the Equator Prize 2008 – a prestigious biennial award that recognizes outstanding local efforts to reduce poverty through the conservation and sustainable use of biodiversity. Sessions will showcase community work and focus on local contributions to achieving global conservation objectives, poverty reduction and the Millennium Development Goals, community conserved areas, pro-poor Reduced Emissions from Avoided Deforestation and Degradation (REDD) schemes, and adaptation to climate change. For full coverage of the Community Poble, please see the report, daily journals, and photo diaries. 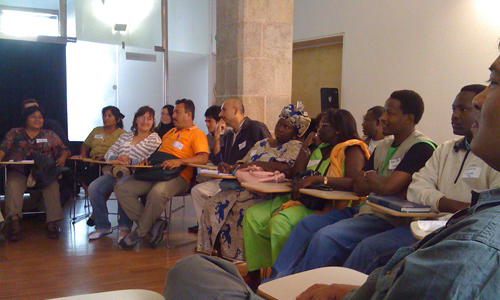 After the safe arrival of community participants from 19 countries to the Community Poble, a two-day orientation session got underway. The objective was to introduce communities to the Equator Initiative and to each other. A team of three facilitators – comprised of Claire Rhodes of Ecoagriculture Partners, Annalisa Bianchessi of Rare Conservation, and Benson Venegas of the Talamanca Initiative – were on hand to guide the event. 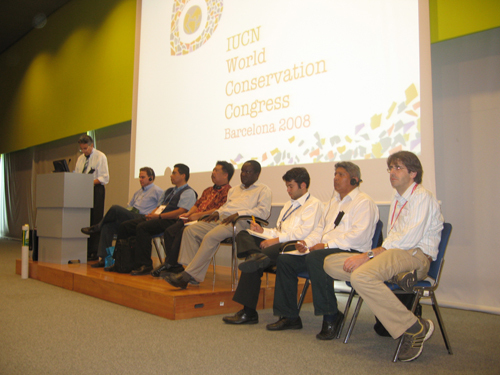 Sunday marked the second day of orientation to the Community Poble and the IUCN World Conservation Congress. Facilitators organized “ice-breaking” activities to get community members more comfortable with one another. 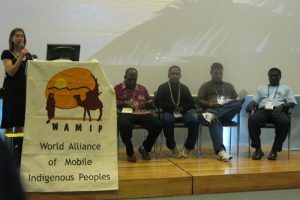 Communities were asked to break into working groups to establish the main points for the community statement at Monday night’s Equator Prize Award Ceremony. Monday marked the official opening of the Community Poble dialogue space, the first dialogue space to be physically located in the heart of a conference. The first session of the day was entitled “Community-Based Approaches to Climate Change in Wetland Ecosystems” and was presented by Wetlands International. The session began with some remarks concerning the role communities can play in climate change adaptation and their role in ensuring this is done sustainably. Following a video presentation, Wetlands International provided a PowerPoint presentation concerning climate change and specific examples of adaptation (bio-rights for communities, floodplain restoration, re-connection of flood plains to rivers, small-scale agriculture, and income diversification). The first session of the day was hosted by the Global Green Grants Fund and was entitled, “How to Build Support for Grassroots Environment Stewardship”. 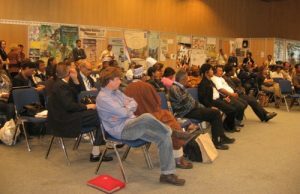 The session began with a discussion of how resources are available to local communities but there are barriers to access or a lack of awareness about their existence. Examples were offered about how communities can be supported with capacity building. The issue of helping communities develop ecotourism was. One participant pointed out the disconnect between rural and urban populations.